"He was excellent wanted to see me again for follow-up." 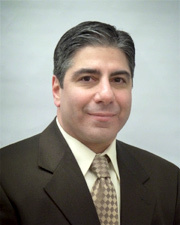 "Dr. George Haralambou is a true professional. He spent a good deal of time with me during my visit... assessing, answering questions and discussing my medications with me. He called me within a few days of my visit to give me my blood work results. I feel very comfortable with him. " "dr haralombou has been very involved in my overall health. he has brought me along with my pulmonary problem, to the point that I an stableas a retired health care professional, I have the utmost respect for dr Haralambou"
"I was very impressed with Dr. Haralambou's overall presentation! He was very courteous put me at ease and went over test results with me very patiently, descending the use of medications very well." "he is a excellent doctor." "Very kind doctor and tries his best. He is an excellent listener & very empathetic. He calls to see how you are feeling when sick and always returns phone calls. One of the best MD's I have ever had." "Yes I love my doctor." "All three doctors are wonderful. I have the utmost confidence in the care & follow up they give me. Especially Dr. Haralambou." "After leaving Dr. K's office I have shared w/my family, friends & my family practitioner how professional Dr. K & his staff is - "
"Dr. Haralambou is a wonderful doctor. The care he shows is amazing I know him for many years - he is the best!" "Dr. Haralambou did a thorough assessment. He was friendly, easy to talk to and made me feel very comfortable. I wish more doctors were like him." "Dr. Haralambou is outstanding in the degree to which he explains your medical condition, allows me to express my worries of concerns, and the amount of empathy he demonstrates in response to my worries or medical problems. He is also very kind and friendly." "Dr. Haralambou is an excellent and caring physician. Would highly recommend him." "As a doctor he is very dedicated person as a human being." "Dr. George H is an excellent care provider and very thorough in all explanations and gives patient full attention." "All doctors should be like this doctor, very patient, helpful, and you're treated with all his attention and tries to help you." "I am being treated by Dr. Haralambou for years and I know he is going to see me - when I get sick - even without previous appointment." "Dr. Haralambou is excellent in all respects professionally & a wonderful person also." "Dr haralombou and.staff have been consistent with my treatments. I am appreciative of his "handling" of my medical issues"
"Very please Dr. Haralambou make me feel very comfortable. He took his time to discuss my concern. Excellent dr., he would return your could as soon as he can, prontly phone call." "Dr. Haralambou is one of the nicest dr.'s I know explains everything and is very nice." "He is the best of all the doctors I see: Kind, practical, knowledgeable, patient and a good sense of humor. He is a good listener & will work with you to take care of you so that you feel like you are part of the decision-making process." "Will and have done recommended many times -"
"Very friendly, always answered my questions in layman terms and has followed up with questions of his own for clarity. Great guy." "I will thoroughly recommend Dr. Haralambou. He is very friendly and care to _____ and explain." "I am very pleased with the care that is given to me." "Would recommend any of the staff to everyone." "Dr. Haralambou was so concerned with my blood pressure, he called my general physician so that she could follow-up with me." "I wish he could be my PCP." "Recommended to my daughter years ago." "He is an extremely knowledgeable & caring dr."
"Excellent dr. Understands my health issue. Thank you." "I have only good experience he would called me to tell me the result of the x-ray. #1. Doctor George Haralambou." "Dr. George Haralambou is one of the best doctor I ever got. He is very concern about my problems, also dedicated enough time on me." "Dr. Haralambou is a remarkably kind & caring physician who never rushes his patient is genuinely concerned about their health & well-being. He returns phone calls & promptly & never rushes you off the phone. I have already recommended 2 people to him & they are both very happy with his care. One of them is my brother." "This physician is most definitely and asset to Northwell and to his patients - excellent physician." "Dr. Haralambou is an excellent and well informed physician." "I trust Dr. Haralambou & respect his depth of knowledge. He is very sincere, polite, calm & knowledgeable. He is a rare find: A very good, thorough doctor AND a nice person." "In my opinion Dr. Haralambou is an excellent physician." "I have complete trust on this doctor. Not only did he treated me but consulted with and referred me to another specialist." "Dr. Haralambou is an excellent dr."
"Wish he was my PCP!" "This doctor is so caring, I would trust him with my life. Others that I have referred to him agree with me." "Always has time to listen to any problems I have, and concerns with meds." "Great personality, knowledgeable on other medical subjects." "Excellent doctor - shows concern. I trust him with my life. Gives excellent care. I would recommend him highly." "Wish all of my doctors were like this doctor." "The doctor was terrific - very thorough & informative - Made me feel like he really cared about me." "I always have a good experience. I feel so lucky to have such a smart and kind doctor."